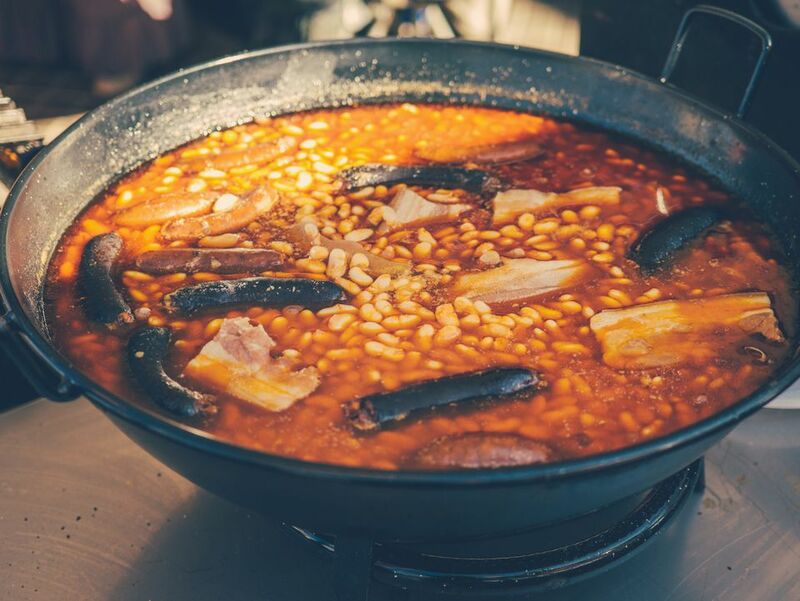 Fabada Asturiana is a typical and very traditional dish from Asturias in the north of Spain. People generally make it for a hearty lunch as it is actually considered too heavy for dinner. It is traditionally made with large white beans, chorizo sausage, blood sausage (morcilla), ham, pork meat, and paprika. Despite the simple ingredient list, this dish can take quite some time to prepare because you have to soak the beans in advance and simmer everything together for a long time. If you don't have the time or all the ingredients, try a simplified version of this delicious bean and sausage stew! This quick and easy fabada Asturiana recipe streamlines the process as it does not require overnight soaking, takes half the cooking time, and only uses a few ingredients. Pour beans into a large pot or bowl and cover with cold water. Turn the burner on high until the water comes to a boil. Boil for 1 minute and then turn off the burner. Cover and let beans sit in the water for one hour. While the beans are sitting, chop the onion into approximately 1/4-inch pieces. Cut the pork into large chunks, about 2-inch squares. Cover the bottom of a large pot with olive oil and heat over medium. When hot, add the chopped onions, garlic, and pork. Sauté until the onions are transparent (but not browned). Remove from heat. Drain water from the beans. Place the beans in the large pot with the sautéed onions and pork. Add water to cover. Add the bay leaf, sliced chorizo, and Spanish paprika. Place back on the stove and turn on high. When the water comes to a boil, reduce to medium. Water should be at a low boil. Simmer until the meat is tender. This takes approximately 1 1/2 hours. Taste the stew and adjust salt if necessary. Serve in soup bowls with crusty bread.